So, how do some of the most popular industries stack up against each other in terms of salary, leadership, and benefits? 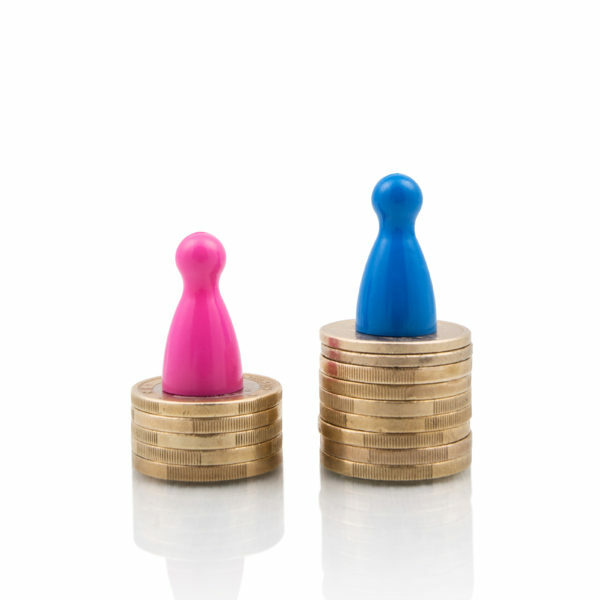 The World Economic Forum has found that in most major industries, a significant amount of women report being paid less than their male counterparts. 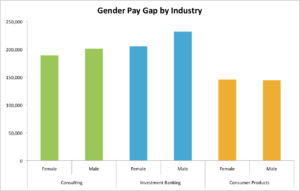 The consumer product industry shows the largest gender wage gap, with almost half of women reporting a difference in pay between genders. That’s not all, this number jumps up to 83% in the business and financial operations sector of the industry specifically. Below are some more numbers reported by real TransparentCareer users, showing in greater detail the extent to which average compensation differs between the genders. Investment banking shows the largest gap, with women reporting average compensation to be almost $30,000 a year less than men. The same trend occurs in the Consumer Product and Consulting industries, but to slightly a lesser degree. Well, you may think, maybe women are being paid less because they’re working less, but in reality the data actually shows that women work, on average, more than 5 hours more a week in each of these 3 industries. Though we’ve progressed since the 80’s when there were no women in top executive positions at any Fortune 100 companies, we certainly have not come even close to equality. Women are still severely underrepresented in higher level roles in most industries and companies. In fact, while women make up 59% of the entry-level college-educated workforce, less than 5% of Fortune 500 CEOs are women. 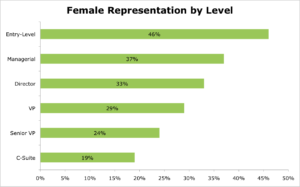 Female representation is fairly equitable at the entry-level, but as employees progress within a company, women are typically left behind. In corporate companies, men are promoted at 30 percent higher rates than women during the early career stages. Though many attribute this simply to women not being “pushy” enough for a promotion, studies say this is false. Women negotiate for promotions and raises just as often as men, but typically face more pushback when they do. According to studies done by McKinsey, there exists a positive relationship between corporate performance and gender diversity. Meaning, companies with greater degrees of gender diversity and equality typically perform better than male-dominated ones. Another report also finds that women CEOs in the Fortune 1000 get 3x the returns than S&P enterprises that are predominantly run by men. So in fact, companies that lag behind in equal hiring and promotions may also be lagging behind in profits. The numbers in leadership positions in finance are dismal, with only 4% female CEO’s and 13% female executive committee members in leading financial industries. But finance is not the only industry that is lagging. Women only make up 10% of consulting partners, and only hold 9% of management positions at Silicon Valley startups. While the numbers may seem disappointing, don’t despair! Many companies are ramping up their diversity hiring initiatives or are working on implementing gender equality programs. Aside from maternity leave, many firms have begun implementing a number of women’s initiatives, which include women mentorship programs and employee resource groups. In addition, over 75% of CEOs list gender inclusion as one of their top 10 business priorities, meaning that though the numbers may not be perfect yet, people are cognizant of this and trying to work towards change. In fact, 28 private-sector companies have recently taken the White House equal pay pledge, meaning they commit to taking additional steps to ensure that all of their female employees are being adequately compensated. Some notable companies that have taken the pledge are Accenture, Spotify, Salesforce, Johnson & Johnson, and Amazon. Finally, maternity leave policies are another benefit that companies have been eager to reconsider. When it comes to the top 8 companies with the most generous maternity leave policies, 7 of them are tech companies. Topping the chart is the streaming giant Netflix, where both parents can get up to an entire year of paid parental leave after birth or adoption. Followed closely behind is Etsy, which offers up to 6 months of paid leave for either parent as well as additional benefits and programs to aid new parents. Check out our in-depth career guides on Consulting, Finance, and Tech to learn more about how these top industries stack up against one another. Want to make sure you’re getting fairly compensated and valued? Well, first you have to get hired. TransparentCareer offers free data on career pathing, compensation packages, and salary negotiation. Sign up for a free account here, and find that dream job.